Art Print: Mr Ernest Hemingway and his adorable pet dog Doris would cordially like to invite you to afternoon tea. This charming print from British artist Sam Toft features the two companions sitting atop a brick wall, with a delicious selection of cakes positioned in front of them, waiting to be devoured. Set on a sunny summer's day and with clear blue skies, it looks as though Horace the duck and all his friends have also invited themselves along to the afternoon! 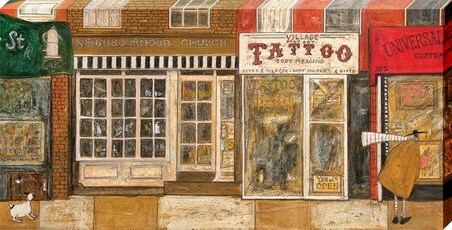 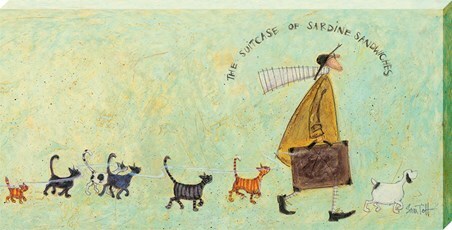 If you're a fan of the work of Toft, then this will make the perfect contemporary addition to your home. 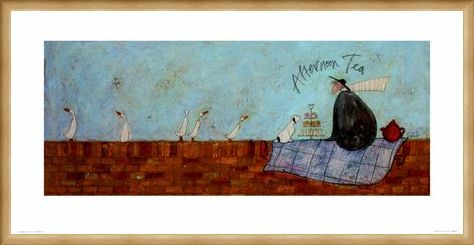 High quality, framed Afternoon Tea, Sam Toft print with a bespoke frame by our custom framing service.